July | 2014 | God Wins...but can I ? This week was very hard for me. I had many tears and moments of sadness missing Leah. There are times that I feel carried along by big ocean waves. The waves are too powerful and strong to paddle against, so I have to let them carry me…bobbing up and down. I had similar feelings when Leah was going through her illness and treatment last year. We couldn’t stop the stress, concern, activity and anxiety. We had to just go with it. Maybe that’s where the expression “go with the flow” came from. A person undergoing hardship or a trial must have come up with this phrase. So, I need your help. What comforts you as you have been through the grief of losing someone you love? Would you share your thoughts with me by leaving a comment? I need new ideas. Right now, it helps me to read quotes and poems about loss and to look at photos of Leah. I like these words from the poem, “When Tomorrow Starts Without Me” by David M. Romano. This photo symbolizes her bravery. It was taken in the beginning of her long series of chemo treatments as she was just starting to lose her hair. 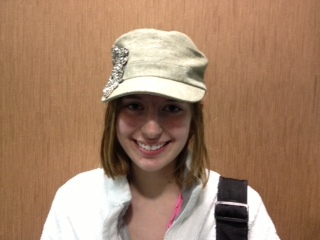 A wonderful nurse Kathy at CDH bought her this cap. And a wonderful receptionist Maria came to our home to cut her hair into this cute bob. I love these two women for how they have blessed my daughter and our family. 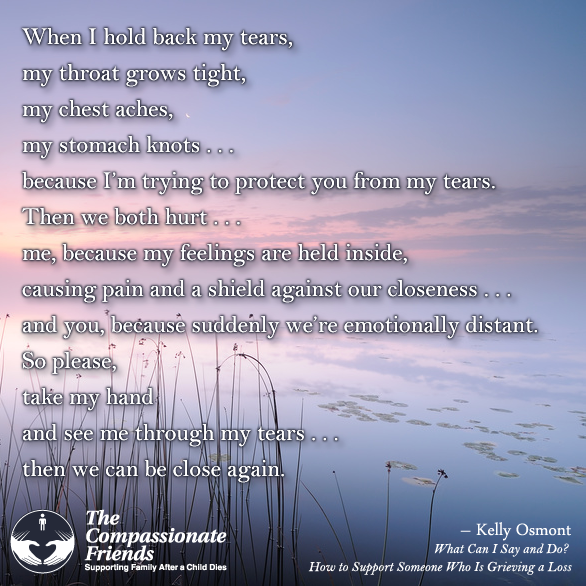 Please share what has comforted you during your time of loss. It will help me. Thank you. Do you have a memory where the image is as clear as a photograph? A memory that you can remember where you were standing, how the room looked, the colors around you, and the expression on someone’s face? One of my most powerful memories is being in the kitchen with my mother when I was in my early 20’s. At the time, I was in a friendship that caused lots of inner turmoil. The roller coaster ride went on for several years. Along the way, I shared with my mom the joys and pain of interactions with this person. The day the friendship ended, my mom’s reaction shocked me. She cried. I can still picture her crying. It was the first time in my life that another person cried because of my pain. She was sincerely sad about my lost friendship. It was stunning to experience her sorrow for me. This interaction drew us closer. I have reflected upon how interesting it has been the way people have responded to me since Leah passed away. Some people have entered into the valley and have risked asking emotional questions. Then there are other people, who I have regular contact with, who haven’t even acknowledged that Leah died. I’d be lying if I didn’t say that the avoidance stuns me and is uncomfortable. I think the avoidance may be the fear of tears. Either mine or theirs. I acknowledge it’s hard to go into the space of asking a parent about his or her child’s death and accompanying grief. Yet, I can tell you the names of people who have cried in person with me. One of the most healing moments I’ve had to date was when a friend and I sat in her car and sobbed for over an hour. She listened as I shared about Leah’s illness and many “Leah moments.” Both sets of our tears were a profound release for me. Someone who was praying for Leah, who I didn’t even know personally, had a chance to meet me. She started to cry talking about Leah being heaven and what Leah was now seeing. She later apologized. I said, “Oh no, don’t apologize. That was a very healing moment for me.” Male friends have also got teary with us at different points along the journey. I think tears are precious. They communicate so much that words cannot. I love that scripture says God captures our tears in a bottle. There are both tears of grief and tears of joy on this journey. Our memories in Paris during Leah’s Make-a-Wish trip bring tears of joy. 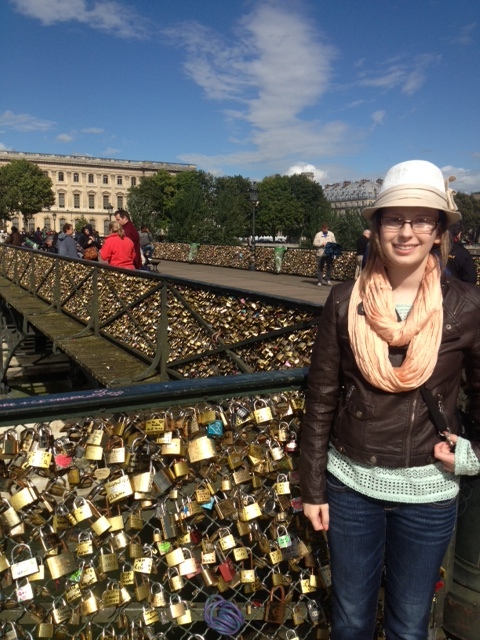 Here’s Leah at the Love Lock bridge – one of her favorite spots in Paris. I cannot speak for all parents who have lost their children – but for me, your tears are comforting gifts – whether you have shed them privately, or with me in person. Please don’t fear your tears or mine.